A place to celebrate Indigenous knowledge, community and healing is growing on the grounds of Wilfrid Laurier University in Brantford. An Indigenous community garden on Laurier's Brantford campus provides students, staff and the wider community with real-world experience learning about the practical uses and healing properties of native plant species. Garden care and knowledge-sharing sessions held each Monday morning from 10 a.m. until noon throughout the summer put a focus on growing techniques, as well as Indigenous knowledge. "For the university community, it provides access to land-based experiential education," said Kandice Baptiste, Laurier's manager of Aboriginal Initiatives. "Another important aspect of the community garden was showing students they can grow things for themselves and live sustainably." The watering, weeding and teaching events – usually attended by about a dozen participants – include an hour in the garden and an hour learning about the natural world. Weekly sessions that began in June have focused on Indigenous ecological world views, using natural medicines and mound and companion planting. Future sessions taking place throughout July and August will focus on biodynamics and the moon cycle, pinching, pruning and cutting plants, natural beekeeping and Indigenous land-based restoration practices. "The garden is an embodiment of Indigenous knowledge," said Baptiste. "This is an absolutely open and accessible space for all of the Laurier, Brantford, Mississaugas of New Credit and Six Nations communities." The garden initiative began three years ago in large part thanks to the efforts of Bonnie Whitlow and Kim Anderson, both early advocates for the project that eventually sprouted behind Aboriginal Student House on Darling Street. Whitlow, aboriginal student support co-ordinator with Laurier, said the garden serves to empower students, staff and the community. "It can't be underestimated how much impact this is going to have," said Whitlow. "It's empowerment and self-sovereignty. When you are able to connect with the bounty of Mother Earth, you're empowered." About 95 per cent of plants growing in the Indigenous community garden are indigenous to southern Ontario. During sessions at Aboriginal Student House, participants have learned how to use those plants to make products including ointments, soap, lip balm, mouthwash and laundry detergent. Sourcing Indigenous knowledge is key to the garden project. Anderson, an associate professor of Indigenous Studies, works with knowledge-keepers from local Indigenous communities, including members of Six Nations of the Grand River Territory, and shares that knowledge in helping grow the garden. She also teaches a course at Laurier's Brantford campus called "The Medicine Garden," which provides students the opportunity to earn academic credit while learning in the garden. Kitty R Lynn, who works with a Six Nations organization called Our Sustenance, provides many of the plants that grow there. "We're really lucky to be so close to people with so much knowledge," Whitlow said of partnerships with the Six Nations community. A donation from Laurier's Office of the Dean of Students will help make significant additions to the garden before the end of this year, including a raised garden bed, stone features, a water feature, seating area and spiral herb garden. In addition, partnerships with Laurier departments including Safety, Health, Environment and Risk Management and Physical Resources help provide health and safety training and equipment to garden volunteers. Laurier's Sustainability Office is providing financial and resource assistance to create a compost area at the back of the garden. 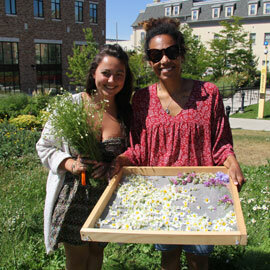 Laurier's Waterloo campus has been home to an Aboriginal community garden since 2013. Located at the Aboriginal Student Centre, the garden is named “Mino-kummik,” which means “the good bountiful earth” in Ojibway.